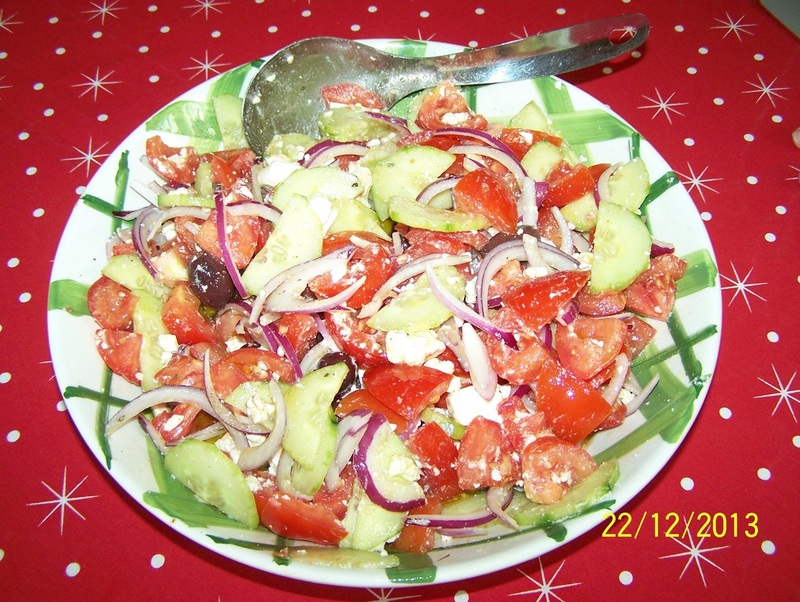 There are so many different versions of the Greek Salad, this is my favourite. What I do, that I love, is I crumble up the feta, instead of cube it. The end result is a little messy, but the feta mixes with the dressing this way and you can't help but dip bread into the dressing as it is amazingly delicious. Also no vinegar is added. My mother never put vinegar in a tomato and cucumber salad, people would eat it at her house and ask how she dressed it, when she said extra virgin olive oil, salt and pepper, no vinegar, guests said they would not put vinegar next time either. This has a few extra ingredients from my mum's salad, but the dressing is the same. I have put 1/2-3/4 cup oil as I started with 1/2 cup, but felt it needed a little more, so this is something that is to taste. Stop adding when you like the taste. Also only a small sprinkling of salt was needed as the feta adds salt. And as for white pepper, I love it, so I add quite a bit, I stop adding when I can taste it, and am happy with the taste. In a large salad bowl add the tomato, onion, cucumber and olives. Season with salt and pepper. Break up the feta over the salad, have some chunky bits, some crumbled bits. Drizzle over the olive oil, give it gentle toss. Taste for seasoning, add more oil, salt and pepper if needed.